Updated 5/31/10 — The PRSA Spring regatta, our Memorial Day Weekend major event, has come and gone! Saturday brought us an overcast morning that slowly cleared, temperatures in the mid 70s, and calm winds until Noon. PRO Nabeel Alsalam wisely postponed, from the docks, the departure until 11:45, and by the time we got to the race course we had a very nice southerly, blowing 7 – 10 MPH. Nabeel got off 3 great Olympic course races for the 7 Lightings, 4 Buccs, 17 Albacores, 4 Hobies and a Thistle who came out. On the Lower Course we had 3 Optis and 2 Penguins. Sunday brought us a promising start with sunny skies, northerly winds at 5 – 10 MPH that unfortunately went light and variable as the day went on, and we gave up on the day at 3 PM at the end of the second race (which not everybody finished, due to a time limit expiration). Upper Course Results here. Lower Course Results here. Our sincere thanks to the regatta organizing committee and to the PRSA members who worked this regatta. They include: PROs Nabeel Alsalam (upper course) and Jennifer Parrow (lower course); Race Committee drivers and helpers Ryan Vear, Stefano de Leo, Red Fehrle, Craig Huzway, Anna Lindel, Elaine Duffe, Inga Barkane, Linda Pacelli, John Hart, Annie Cross, Bill Swanson, Kate Dixon, Steve Parsons, and Thomas Jagodits; Registration workers Will Phillippe, Jeff Neurauter, Happy Olmstead, Wilda Heiss, Steve Parsons, and Barb Thompson; Planning the post-race barbeque and bringing food and beer: Pat McGee and Scott Snyder; producing the NOR and SIs, and acquiring trophies, scorekeeping, recruiting RC, and Boat Duty, Nabeel Alsalam. Well done! Per PRSA Commodore Pat McGee: Starting Saturday morning many members just kicked in. I was really pleased by the amount of general pitching in. I could not move more than a few steps without someone offering to help. It made me very pleased with our membership. Maybe this is explained by our having shrunk into a core group (family). I owe all of you all a big thank you. I can’t thank you guys enough for just picking things up and making it all happen. Get’er done mentality. Nabeel – RC — great decisions – sitting on the docks for 90 minutes Sat., I know you were getting some pressured commentary – Great work! “Rules Around the Race Course” seminar March 27 at Mount Vernon Yacht Club! John McCarthy’s famous racing seminar is sponsored by DISC and MVYC. Details here. Reserve by March 20. Video of the Week: Know Your Knots! MARINA UPDATE as of Saturday Afternoon, 2/13. I first want to thank all of the slipholders who came down on Tuesday to clean off their boats. Many stayed to help out a neighbor. Without this effort many more could have gone down on Wednesday. Related story, with photos, here. The only boats still down are G-6 and D-2. If you have not cleaned off your boat yet please do so before Monday as we are expecting a few more inches. There are paths to each dock and down each of the docks. The paths down the docks are icy so be careful. The dry slip area has been partially plowed. All rows except between A and B have a path. The rest will be plowed Sunday or Monday morning. At first glance there appears to be no damage done to the boats. The parking lot has been plowed and there is plenty of space to park. 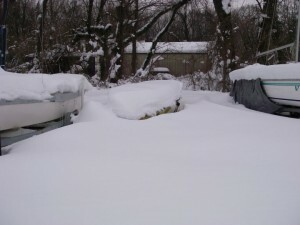 Blizzard of 2010 Dumps 3-foot Drifts of Snow at WSM! Doug and I did go to the marina. Nothing was plowed so we parked in the turn-in lane in front of the marina entrance. Walked through drifts that were over 3 feet in places–worthy of some pictures. The trail had become a cross-country skiing path. Good News–none of the covers we checked were torn although several under severe stress. We cleared snow and ice off all six covers (David; Jeff; John; Laurie; Rick; Marian) and the one near John’s boat in K-20. It has a dark green hull; don’t know who owns it. A word of warning–the entrance to marina off the parkway is closed due to a wall of snow piled up by plows. And, no plowing of the road inside the marina. We don’t yet know the impact of “Round 2” (Tuesday afternoon through Wednesday night), but it did drop another 10 inches of snow and then whirled it around in 20 MPH winds with gusts above 40. The first person to make it to the marina today — please send pictures! Per Brian Pavlik, as of Thursday morning the entrance to the marina is cleared, but there is no place to park. Plowing is scheduled for today (Friday).